For Day 3 of my “12 Days of Birthday” Celebrations, I hosted the Go Epicurista Ultimate Progressive Dinner in Winter Park. It was a perfect way to enjoy several great restaurants in one night. We started with a fun chocolate party at Peterbrooke Chocolatier (recap here), then “progressed” for a short walk to The Wine Room on Park Avenue. If Winter Park is considered the Foodie Hub of Orlando due to the large amount of amazing local restaurants, our second stop felt like the epicenter of the hustle and bustle on this busy Saturday night. 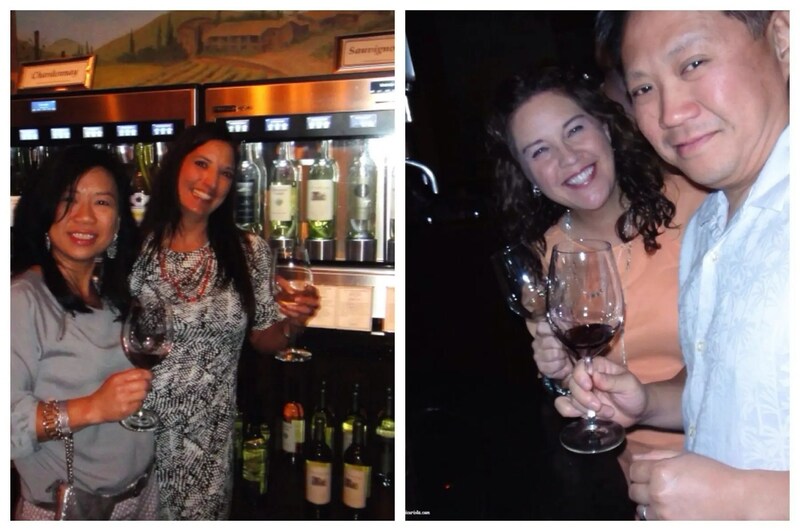 Voted “Best Wine Bar” by Orlando Magazine in 2014, The Wine Room is a wine-lovers paradise! 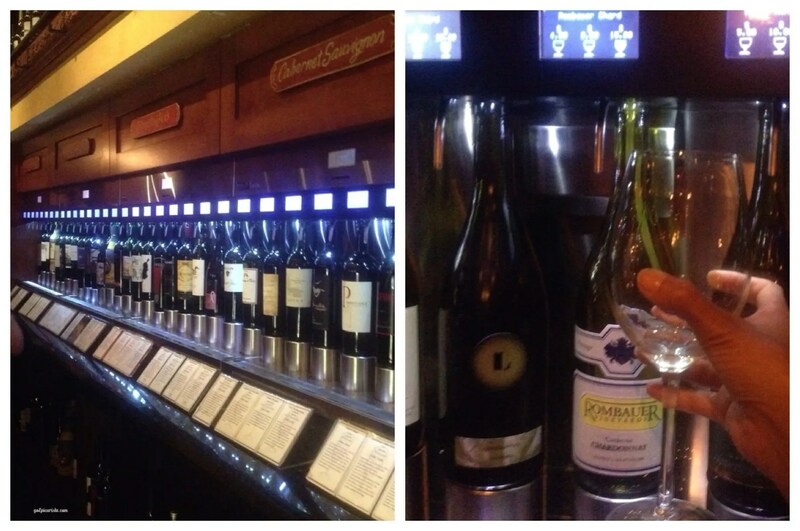 State-of-the-art Enomatic machines line the walls throughout this wine bar / wine store dispensing over 156 different wines in “Try it, Like it or Love it” 1, 2.5, and 5 oz sized pours. As you enter, you purchase a “Wine Tasting card”($3) and load it with your estimated dollar amount to spend for the evening. The card is yours to keep so any amount you don’t spend in one night stays on there for future use. A great way to keep you coming back. Prices range from $1.50 per ounce to over $15 per ounce for the high-end selections. My guests were like kids in a candy store. With so many wine choices, they were running around all over the place. Most of us sampled 3 wines and then picked a favorite. Insert the card in the machine, select the size pour, put your glass under the spout and voila! Your wine tasting journey begins. It is a great way to sample different wines and find ones to love. Their selection is rotated frequently which is another reason they keep you coming back time and time again. If you liked a particular wine during a previous visit and you can’t remember the name, your card can be scanned to reveal your purchase history. Good in one way but possibly bad in another (I had how many different wines?!) Wine bottles are also available for purchase to consume on premise or take home which is a more economical option for a group once you find a wine you love. The Vault Doors… Serious Security! There are several seating areas and a bar among all the Enomatic machines and wine shelves on the first floor, and as I mentioned, this place gets quite busy on most nights, especially weekends. You mus arrive early to find a table. I surprised my guests with a cool secret(ish) room downstairs for a more quiet and intimate setting in The Vault. 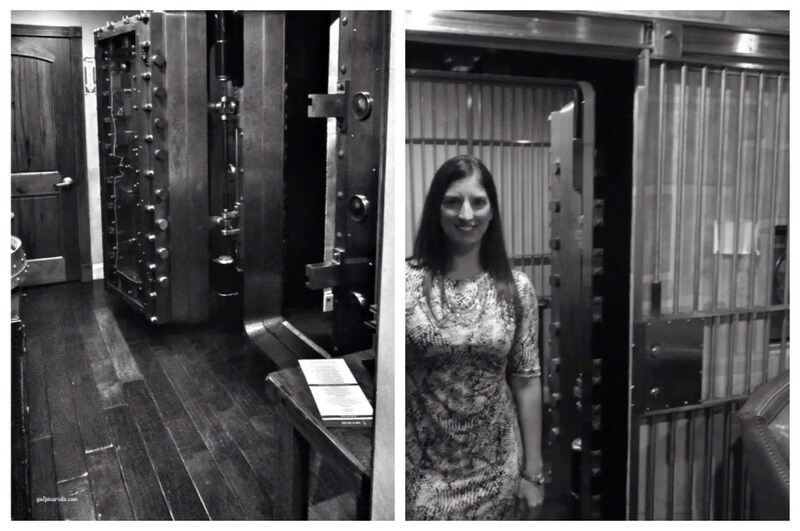 Yes, this was an actual vault of the bank which occupied this building and has now been converted to a private lounge. It no longer holds actual money, unless of course you consider the private wine lockers housed there. For an annual membership fee, you can securely store your prized wines too. It was a very cool experience to sit in this area as it felt like we were in the secret room of a mansion. We sat in comfy leather couches and ottomans, like your living room, if you lived in a French Chateau! The room is only used for parties, meetings and special occasions so I was thrilled to be celebrating my birthday here. I was very thankful to The Wine Room for accommodating my reservation on a busy weekend night. Our server was very attentive and made sure our platters were delivered promptly so we could stay on our Progressive Dinner schedule. 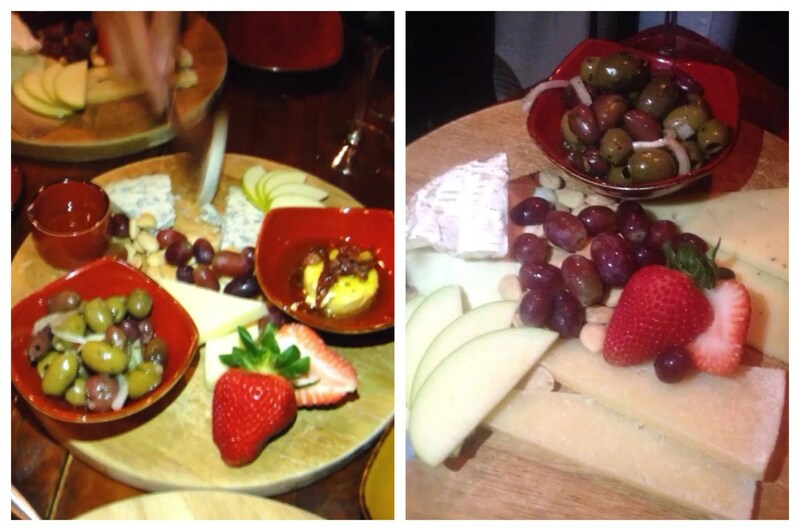 The chef selected the most popular Artisan cheeses and charcuteries on the menu for us to sample. I always prefer to let the culinary geniuses be creative and follow their recommendations. They know what is best, freshest and most unusual and his selections did not disappoint. It was like a feeding frenzy of arms crossing one another as everyone sampled all the goodies. The Wine Room has an extensive selection of Artisan cheeses. We sampled the Harbison, a bloomy-rind cheese with woodsy, sweet flavors, Prairie Breeze aged white cheddar, Belle Chevre goat cheese, Truffled Gouda (everyone’s favorite), Fiscalini Bandaged Cheddar and Points Reyes Original Blue. 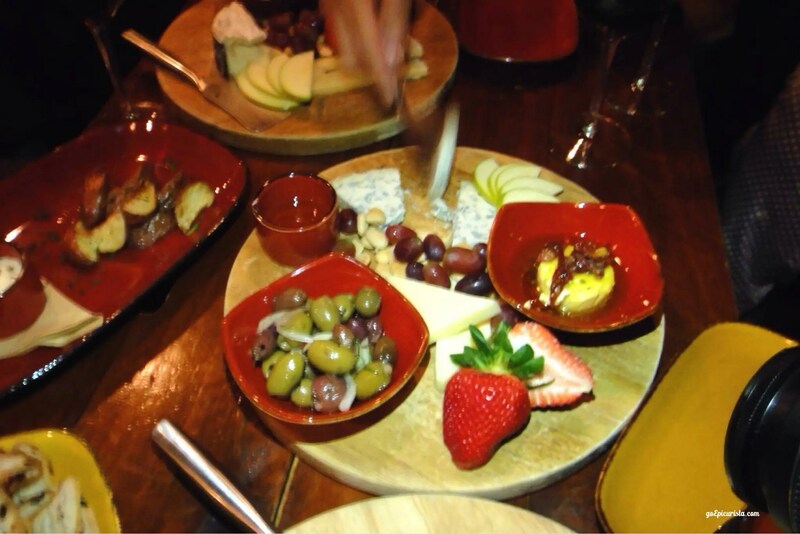 The cheese platters were beautifully accompanied by fresh-baked crusty bread, marinated olives, pickled vegetables, Marcona almonds, grapes and strawberries. 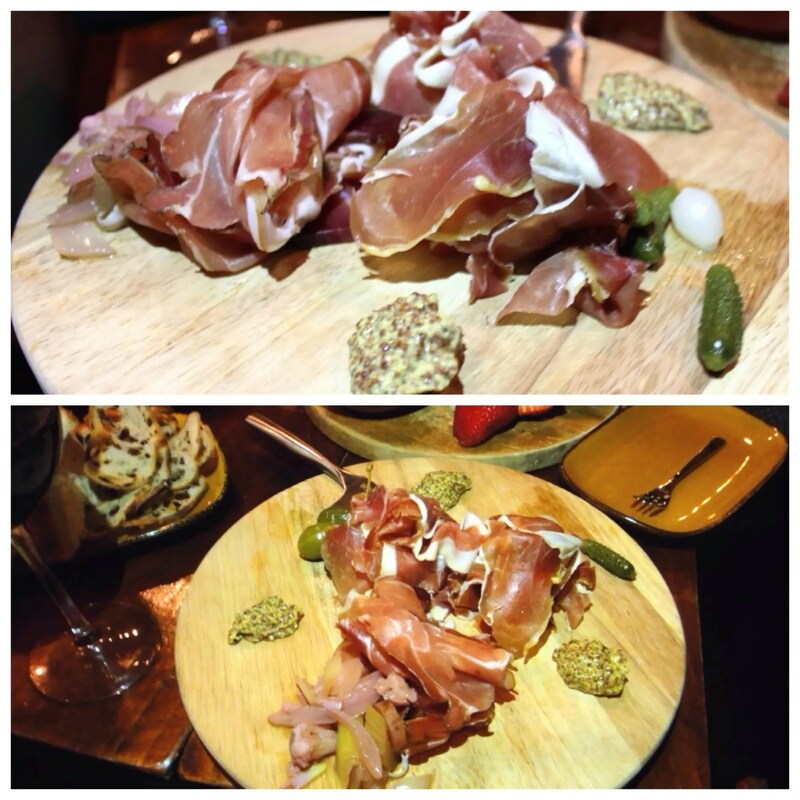 The charcuterie plate was a nice assortment of thinly sliced Jamon Serrano, Prosciutto di Parma and Speck Americano. It’s amazing how food can transport you to other places…I felt like we were in a lounge in France or Tapas bar in Spain. This was wine and cheese pairing at its best. 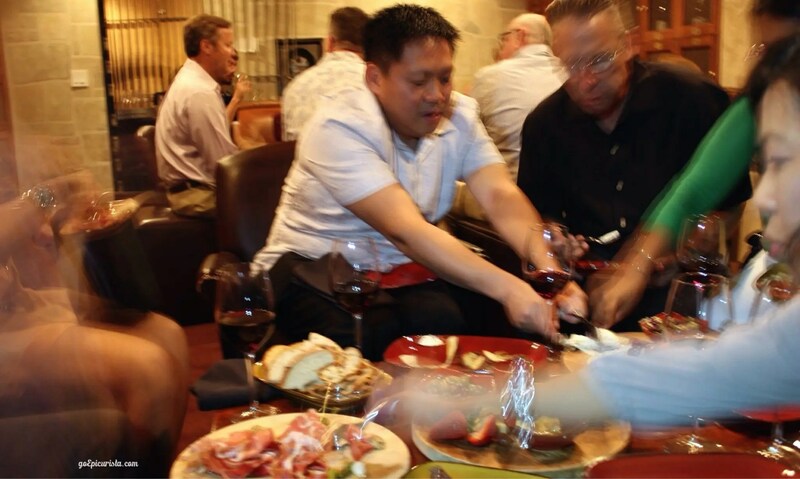 It’s no surprise The Wine Room was given the “Best of Award of Excellence” by Wine Spectator Magazine! The menu offers tapas style dishes, mimosas for $3 all day and beer for those non-wine lovers out there. To reserve The Vault for a special event call 407-696-9463. 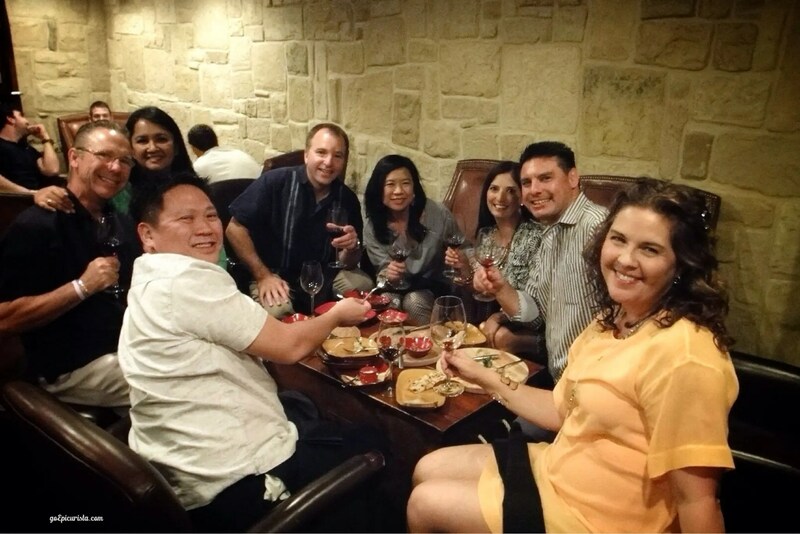 Everyone in the group loved the ambiance and the unique experience of having the various wines to sample and the quaintness of the vault. The Wine room is located on 270 South Park Avenue, Winter Park FL. Enjoying Go Epicurista Ultimate Progressive Dinner in The Vault! After getting our fill of wine and cheese we strolled further down Park Avenue enjoying some window shopping and arrived at our next destination. A place that surprised my guests as they thought our dinner was over when in fact it was only about to get even better! Check out our third stop on the Go Epicurista Ultimate Progressive Dinner Barnie’s CoffeeKitchen. Things got a whole lot breezy and fun! If you’re curious what 12 Days of Birthdays is all about, click here. It is the best cure for the Birthday Blues. I hope you will join me on this culinary journey! Do you have a favorite wine and cheese pairing? Please share in the comments below. I would love to hear about it. If you liked this post and thought it would be a fun outing with your friends or if you’ve been saying you want to do a unique wine and cheese tasting “someday”, then please share with your friends using the links below. Set a date, get planning and #MakeSomedayHappen! 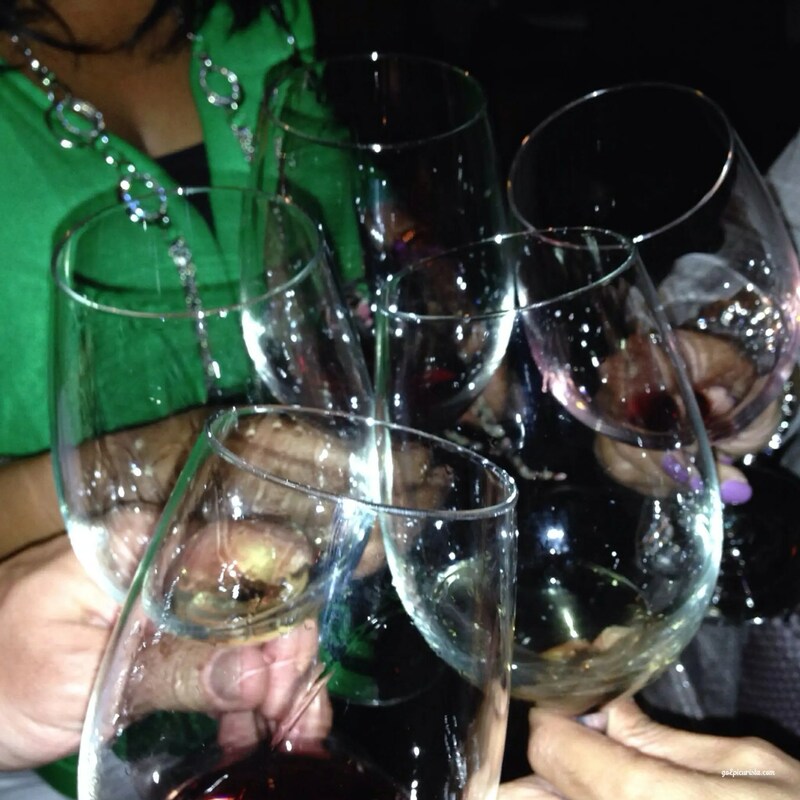 Cheers from The Wine Room!